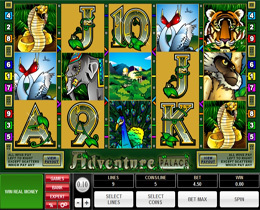 Adventure Palace is a video slot machine game with a “Wild Jungle” theme. It is a very exciting game filled with free spins and a bonus feature which allows for extra winning opportunities. The game has over 34 winning combinations with numerous winning symbols which include Jungle Palace symbol (Scatter), elephant (Wild and Jackpot), Tiger, Monkey, Peacock, Snake, Swans and the high valued symbols of playing cards. Lively and fun filled background music and elephants trumpeting makes it even more enjoyable. Wild symbols appear anywhere on the reels and are animated when they form a winning combination. The scatter symbol is what triggers the free spin feature which allows for additional games as well as multipliers for winnings during this game. Betting ranges between 0.01 cents and $1.00, with the choice to play up to $45 maximum bet per spin, thus making it suitable for penny slot lovers.